Rev. Cherokee was a remote character at the Maxwell Street Market in the 1960s and 1970s, who had a promoter at the Market. 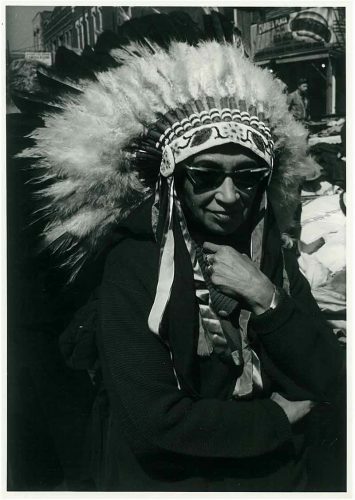 In Native American headdress, this individual promoted her services to potential clients as the “Indian Healer” and “woman of God” by distributing her pamphlet that directed them to her private home at 11753 S. Halsted, where she kept hours from 9:00 a.m. to 9:00 p.m. every Sunday. She charged $1.00 for a visit. All images published by the Maxwell Street Foundation within this website are copyright of the artist and are for educational, personal, and/or noncommercial use only. For any other use, please contact gro.n1555618649oitad1555618649nuoft1555618649eerts1555618649llewx1555618649am@of1555618649ni1555618649.